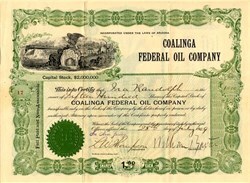 Beautiful certificate from the Coalinga Federal Oil Company issued in 1909. This historic document was printed by Broun-Green Company and has an ornate border around it with a vignette of an eagle and a waterfall next to a town. This item has the signatures of the Company's President, William Baxter and Treasurer, L. W. Thompson and is over 99 years old.